Speed Braiding? What is that? I have just uploaded my latest vidoe to YouTube, but I had a bit of trouble deciding what title to give it. 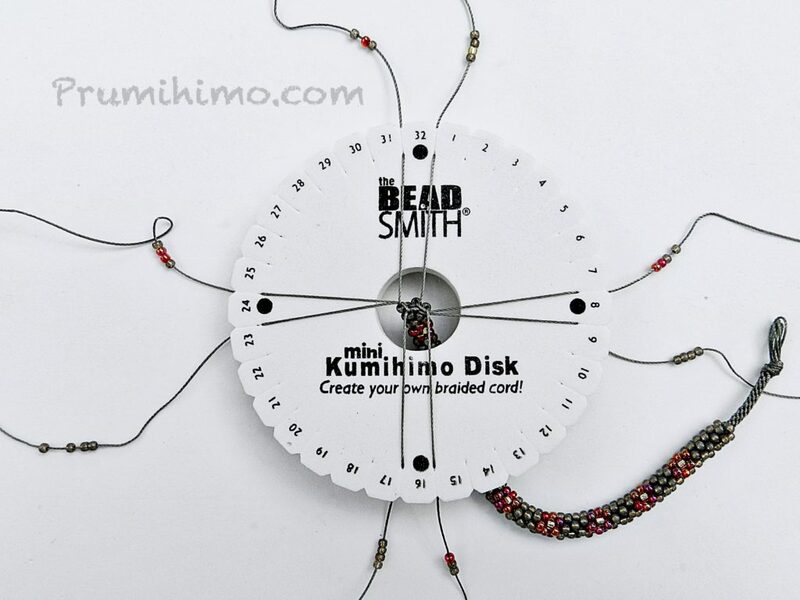 In the end I decided to call it ‘Speed Braiding’ because I demonstrate how you can build up quite a bit of speed on a kumihimo disk by breaking what is a commonly believed rule. In my videos I like to share what I have learnt and what works for me and sometimes that goes against what I may have been taught when I first learnt to braid on a disk. The first instructions I followed for 8 cord Round Braid or Kongo Gumi stated that the disk could be turned in either direction, but that it then must always be turned in the same direction. That is good advice for beginners, but it is not the whole story. In this video I hope to prove that the disk can not only be turned in either direction, but that consistency in the direction of turn is not necessary. In fact, you can change direction whenever you want to and you can even turn the disk to and fro. By turning the disk to and fro you do not need to change your grip on the disk, making the action of braiding very smooth and swift. This method is used by some of the most experienced disk braiders I know. I do need to stress that this is only the case for 8 cord braids. When you use more cords for Round Braid it is a different story, but as 90 per cent of the kumihimo braiding I see on social media and forums is this type of braid I hope that this will be interesting and useful for many people. I also hope that it will provide insight into the way this braid works. I recommend giving it a go to see for yourself that it works. You may prefer to return to what is familiar to you, but at least you will know that when you try a pattern or tutorial for this type of braid you will not need to worry about which way to turn the disk. The to and fro method also works for complicated counted patterns, as I show in the video. When I reviewed the video I realised that I should have chosen a greater contrast for the beads in the braid for the pattern to show up. It is a simple flower design in red and gold running along one side of the braid. It was calculated by using the brilliant Kumihimo with Beads App, which is available in the app store. I braided for a bit turning to the right and then to the left and then going to and fro. Every bead ends up exactly where it should! As many of my blog readers know, I was for several years a Guest Designer for Jewellery Maker TV. This involved making 10-20 kumihimo designs to display on the show in usually less than a week. Speed was essential and that is when this method was an absolute life saver for me! This video may not be to everyone’s taste, but I hope it will get people thinking. If you prefer project-style videos from me, don’t worry I have got lots of lovely projects coming up shortly!